The memorial and information plaques are located at the east end of the Grassmarket. The Grassmarket is an wide open street on the south side of Edinburgh's Old Town. The city had the public gallows there, and many Covenanters were executed during the Covenanting period. A circular memorial, erected by public subscription in 1937, marks the site, and an adjoining plaque lists the names of the many Covenanters who were hanged there. 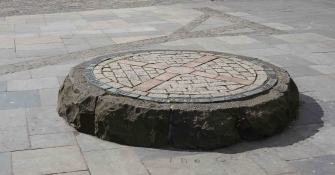 In a recent renovation of the locality, a representation of the gallows' shadow was made on the ground using different coloured stone, as seen in the picture to the left.